Coming to Pune for a business trip or looking for a great accommodation for out-station friends? Ditch the hotels and check out Hermitage Suites in Koregaon Park for apartment and penthouse suites that can easily house up to 6-8 people at a time. Unlike hotels, Hermitage Suites feels like staying at home; a lot of space, ample of natural light and great views. The apartments are well-appointed with master bedrooms, a private terrace, a small kitchenette and a dining room. We particularly loved the 3-bedroom private garden villa spread across 1,500 square feet. 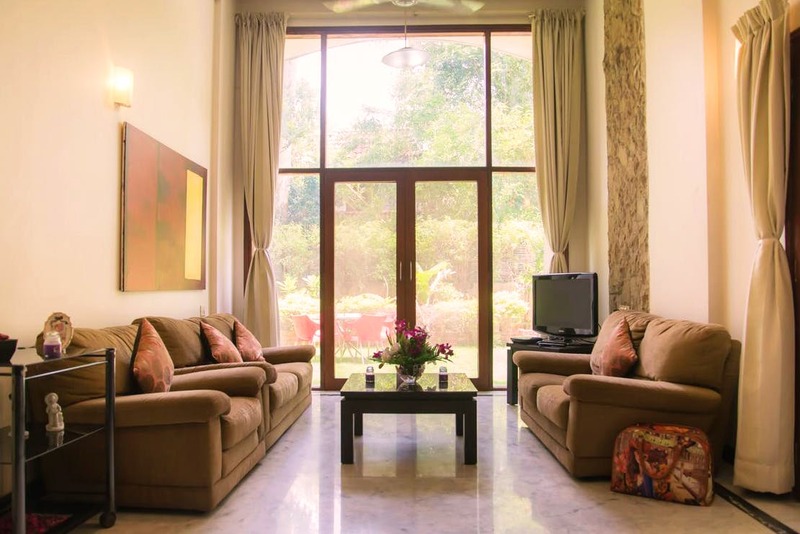 The place is extremely spacious and is tastefully done up with soft beige curtains, luxe furniture and a garden sit-out. Families and large groups must check out Hermitage's penthouse suite that can easily accommodate up to eight guests. The price for a night ranges between INR 8,000 and INR 12,000 for the entire apartment. We think it's a pretty sweet deal considering the amount covers stay for more than at least four people. Parking is a bit of an issue out here. If you need parking space, make sure you tell them when you book. Hermitage Suites is a hot property in Koregaon Park and gets booked quickly. We recommend you book your stay well in advance.